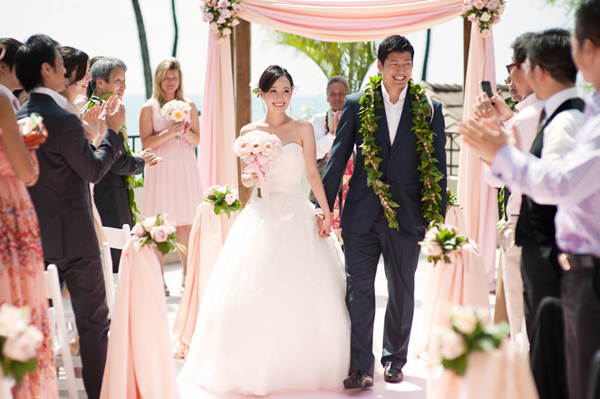 There is something magical about Hawaiian weddings, and Michiko & Riki’s wedding is a perfect example. With beautiful scenery, delicious food, and amazing magic and violin performances, their wedding is truly a warm and joyful celebration of love. Talented photographer, Derek Wong, captured all the unforgettable moments of this beautiful day. Join us as we share Michiko and Ricki’s story along with the wonderful photos from Derek Wong. Michiko & Riki: We met in Boston where we both attended college. We became good friends but nothing more. After graduation, we both started working in Tokyo where we crossed paths and started dating. Soon after, we realized that we are perfect for each other. Michiko & Riki: We had a beautiful wedding with friends and families at Halekulani in Honolulu, Hawaii on October 7th, 2012. Our wedding ceremony was conducted in Japanese, English and Hawaiian by Kahu Bruce. Our florist Bill Maliglig prepared gorgeous bouquets and decorations with garden roses. The ombre pink wedding cake prepared by Joselyn Benn was exactly what Michiko had in mind. Our friends Ryu Goto and Kenta Koga surprised our guests by performing magic and playing the violin. We love looking through these photographs captured by Derek Wong, as they let us relive the happiest moments during our perfect wedding day. Derek Wong: There were a lot of great moments to photograph at Michiko and Riki’s wedding, and it was fascinating to capture the connection between the couple. The Halekulani is one of the premier venues in Hawaii, and it’s an amazing place to have a wedding. One of the highlights of the day was watching Kenta Koga, one of the couple’s friends, perform his magic. He is one of the most phenomenal Magicians i’ve seen and a world class act. Ryu Goto, another friend of the Bride and Groom and one of the premier classical violinist in the world, left some guests in tears after performed a very romantic and emotional piece on his violin. The couple had an amazing day surrounded by their talented and loving friends. 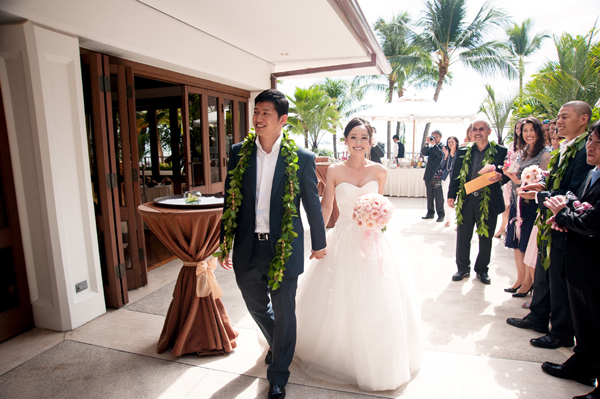 Derek Wong has created some of the most memorable wedding images in Hawaii. He is recognized as one of the World’s Top Wedding Photographers. What sets him apart from other photographers are his attention to detail, commitment to quality, and talent for capturing moving images.